Some of you may have seen the BBC2 adaptation of The Thirteenth Tale that was shown shortly after Christmas, starring Olivia Colman and Vanessa Redgrave. If you did, you'll know it was excellent, but if you didn't, read the book instead because, as usual*, the book is even better. The Thirteenth Tale by Diane Setterfield is, as the title suggests, a story about stories. It's also a story about twins, and loss, and loneliness, and the gradual decline of the upper classes in the early 20th century, and all manner of other things. It's not so much a mystery as a seemingly limitless number of mysteries: the plot, and indeed the characters, are packed with intrigue. The book begins with Margaret Lea, a bookseller who has written a few obscure biographies of lesser-known Victorian authors, being commissioned to write the life story of Vida Winter, an immensely successful but notoriously private author known for telling capricious fibs to anyone who interviews her. Miss Winter is a prickly character - and not an easy one for either the reader or Margaret to like from the outset - but is prepared to reveal that she was born Adeline March, twin sister of Emmeline March, into a frighteningly dysfunctional family, all of whom appear to suffer from varying degrees of mental illness. Left almost entirely to their own devices with only the occasional intervention of the family's last remaining servants, housekeeper The Missus and gardener John-the-dig, the twins are entirely isolated from other children, speaking their own secret language and distinguishable from one another only by their differing personalities: Adeline is prone to violent outbursts, while Emmeline is gentle and good-natured. 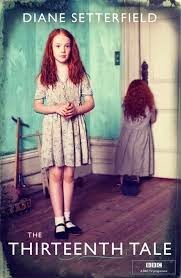 All Margaret knows at the start of Miss Winter's story is that Angelfield, the house in which the twins grew up, was destroyed in a fire when they were 17, and Miss Winter's narrative almost immediately begins to raise more questions than it answers. Who is the twins' father? Why did their uncle disappear one day and never return? Why does the twins' otherwise ultra-rational governess imagine that Angelfield is haunted? There are all manner of clues littered throughout this rambling, modern-gothic narrative, but this is much more than just a clever mystery with elements of psychological thriller. The Thirteenth Tale also explores loss, identity and the desperate need we all have to tell stories, as if the very act of storytelling in itself can be cathartic and reconciling. Margaret, struggling with her own unresolved guilt and repressed bereavement after a tragedy that occurred shortly after her birth, seems able to relate to others only through the medium of books - and she admits that she prefers the novels of the 18th and 19th centuries to contemporary fiction because she prefers 'proper endings'. Her determination to find such endings for the characters in Miss Winter's story - and Margaret's own - means that The Thirteenth Tale does have, in some ways, the atmosphere of a 19th century novel, and there are recurring references throughout to Jane Eyre. However, it was really Wuthering Heights that kept springing to mind as I read this book, with its lonely, crumbling house, destructive, obsessive relationships and the recurring repercussions of each generation's actions for the next. This is a novel that's far from concise, and like its Victorian predecessors, it doesn't always maintain a speedy pace. Despite this I never felt I was reading wasted words. Every detail contributes something, whether a practical clue to the mysteries of the plot or a psychological insight. Yes, it's convoluted and yes, a couple of the twists require some suspension of disbelief, but it's remarkably sensitively written, with a genuine sympathy for even the most unhinged of characters - almost all of them have experienced a loss of one kind or another that has left them feeling less than whole, and Diane Setterfield evokes this sense of incompleteness with considerable skill. The Thirteenth Tale could easily have become an overblown, sensationalist potboiler in the hands of a lesser author, but Setterfield has managed to strike the perfect balance between a gripping plot full of surprises and an astute, sometimes heartbreaking analysis of what it means to live with what feels like a part of oneself missing. Oh, and yes, it does have very much what Margaret would call a 'proper ending'. I've often been told that The Godfather is a better film than it is a book, but I wouldn't know because I haven't read it.